Catering for all abilities, this yoga retreat will give you a chance to de-stress and unwind, whether you are a more experienced practitioner or have never done yoga previously. With a strictly limited number of guests there will be plenty of opportunity for individual attention and we will combine energising Vinyasa Flow with restorative and nurturing yoga practices as well as shared meals, time in nature and the chance for you to experience some stillness. Le Perchoir des Paons is situated in a beautiful valley outside the village of Gindou in the Lot Region of South West France. The renovated stone farmhouse provides a comfortable and relaxed environment to unwind from everyday life. Facilities include an art studio and outdoor swimming pool. 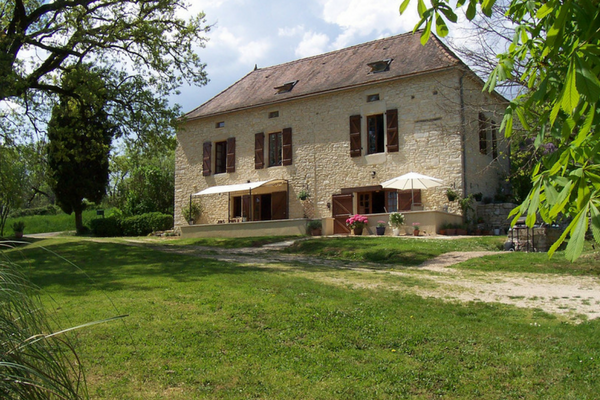 Doing yoga in the beautiful rural French countryside, nourishing yourself with time, space and beautiful food, will leave you feeling refreshed and revitalized in order to return home less stressed and open to the hustle and bustle of normal life. All meals will be vegetarian and utilise much of the local produce. There will be an abundance of colour and flavour in all dishes and specific dietary requirements can be catered for. Dishes will be designed to nurture the body during the weekend to ensure you feel energized throughout your stay. The closest airport is Bergerac (about an hour away) which is served by Ryanair, Flybe, British Airways and Jet2 from various UK airport. Brive is also just over an hour away and has a couple of services a week through Ryanair. Toulouse is around 2 hours away and is easily accessible by train. Toulouse is served by EasyJet. Transfers are available at an additional cost or car hire from any airports is available. Friday, Ryan Air – London Stansted at 7.16am – arrives in Bergerac at 10am. The local area is one of true beauty and there is plenty to explore – from market visits, local towns, canoeing and plenty of foodie extravaganzas. If you would like to stay additional nights before or after the retreat you are more than welcome and prices would be charged on a standard B&B rate with optional evening meal. Please request prices for this separately. All activities are optional – this is your break and you can choose to do as much or as little as feels right for your mind and body. On arrival – at 12pm based on the Bergerac flight, there will be time to settle into your rooms before a light lunch and the chance to relax. At 6.15pm there will be a 75 minute yoga and meditation practice. 8pm welcome drinks and a three course meal will be served. 8am Energising Yoga Flow for 90 minutes. 7pm aperitifs and three course dinner. 8.30am Energising Yoga Flow for 90 minutes. 12pm departure based on the flights suggested. Prices include all yoga, equipment, accommodation and meals. Prices DO NOT include transfers, flights and additional spending money. Room 1 - Two single beds, or can be one double. Shared bathroom. Price for one person £435. Price for two people sharing per person £295. Room 2 - SOLD - Small double bed, shared bathroom. Price £325. Room 3 - Small double bed, shared bathroom. Price £325. Room 4 - SOLD - Double or Triple Room, shared bathroom. Price for two people sharing per person £295. Price per person based on three people sharing £265.